The Real presence Eucharistic Education and Adoration Association founded by the late Fr. 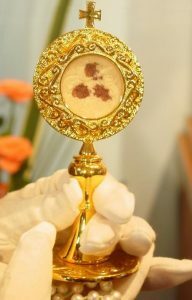 John A. Hardon, S. J. has worked with the Pontifical Academy Colturum Martyrum to present miracles associated with faith in and the worship of the Most Blessed Sacrament through the Vatican International Exhibit: the Eucharistic miracles of the world. Come and see this amazing exhibit!